H2Os announcement to dealers is totally lacking in details like which plans will get LTE, if it will cost extra or if it will be throttled. Although LTE is capable of throughput as high as 60 or even 100 Mbps, prepaid MVNOs, especially Verizon ones, tend to throttle it to lower speeds, as low as 5 Mbps for Verizon nased PagePlus and Straight Talk, Even Cricket Wireless, which is part or AT&T, and thus not a MVNO, throttles LTE speeds to 8 Mbps. Hopefully, H2O won't play the throttling game. Of course, AT&T could give H2O no choice by imposing a throttle at the source. 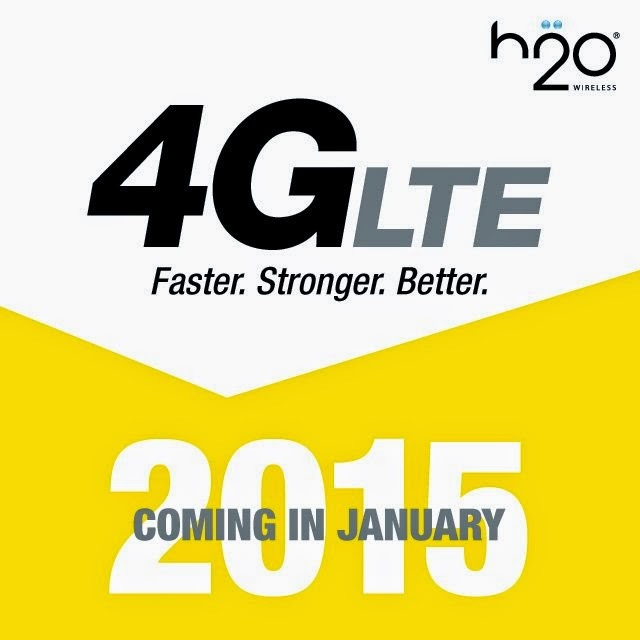 LTE coming to H2O probably means that other AT&T MVNOs will be getting it soon too. And that means more competition and if AT&T LTE is unthrottled, pressure on Verizon MVNOs to remove the speed restrictions on their LTE offerings. Red Pocket has LTE on all of their AT&T plans now. Do you have evidence of that? Their website only says 4G LTE on the $69.99 plan. The other GSMA plans are described as having "high speed" data. Red Pocket GSMA customers: change your device data settings and get LTE! Attention Red Pocket GSMA customers: a quick update to your account and your phone's data settings and you can access 4G LTE for even faster data speeds! If you're a Red Pocket GSMA customer and you're ready to make the switch to blazing-fast 4G LTE, just submit your information to us by going to http://GoRedPocket.com/gsmaswitch and filling out the needed fields. Once we receive your submission, we will quickly make some needed changes to your account. Then we will send you an email with further instructions for configuring your phone's data settings. Additional background on data settings for GSMA phones may also be found in this Knowledge Base article. Please note that you will need an LTE-capable device in order to access LTE speeds. Do current h2o users need to change a new SIM card to get LTE? Probably not but H2O hasm't released any details yet. Wonder if Airvoice will also get it? H20 already throttles the crap out of their data, at least they do on Paygo! Although not enough to make me budge from my T-Mobile secret $30/month plan (5Gb LTE data, unlimited text + 100 minutes), it is an interesting development, especially if they don't change the current pricing structure. H2O offers the best value when it comes to light usage for both voice, text, and data. Can't beat $3.33/month (technically $10 for 3 months) with rollovers! Now if only they'd get rid of the annoying often-complained push notification on the PayGo plan! Secret? No its publicly listed on T-Mobile prepaid plan page. Exclusive? Yes, existing sim accounts are ineligible to switch to the plan. A good value? Highly debatable for "phones" with only 100 minutes and it can't be used in a tablet. Inform Tmobile as it's listed on their prepaid site. I'm also starting to question the value , a couple years ago it was a steal, now it's nothing special. "A good value? Highly debatable for "phones" with only 100 minutes and it can't be used in a tablet." It's an average deal. The coverage for the data is for only a small fraction of America. 100 minutes can be OK for some. So, worst data plan in America, and a minimal amount of minutes... no, the $30 plan doesn't look that good. More BS. T-Mo HSPA+ reaches 285 million people in US and LTE reaches 260 million. This plan is the best deal around for folks who want a lot of phone data for a low price. I currently get 4 to 8 mbps download speeds on H2O without LTE, so it is bound to be faster than that. On the $30 monthly plan. Does H2O send push notifications on all of their plans or only on PayGo? Any guesses if H2O and other AT&T MVNOs will offer LTE on PayGo? Push notifications are only on PayGo. No idea about LTE on PayGo. Do Windows phones also get H2O's push notifications or is it only on Android phones? And can they be blocked or disabled on Android? All phones get USSD push balance notifications on H2O pay as you go plans. There are Android apps that can hide them. See Prepaid Operator Profile: H2O Wireless. Good but need unlimited data (soft cap).